Greetings friends and fellow crafters, LeeAnn here and welcome to the A2Z Scrappbooking blog. I’m here today with an adorable Welcome Baby card I made for a friend who had a baby back in February. I am finally meeting her for the first time in a week and am so excited. I have so many cards made (I make them all the time, but never send them). Anyway, on with the card… Using the adorable image from SugarTree Stamps Sweet Baby set I printed the image and sentiment, cut the image using my Scan N Cut and the sentiment with the Banner Die from the Hero Arts Ribbon Messages Stamp/Cut set. The Ink I used is a combination of Hero Arts Passion Flower and Pink from the Clearly Kelly Miami Collection.. The ribbon and glitter dots are from my stash. The a2z scrapbooking store carries a wide variety of Hero Arts products as well as a nice selection of digital stamps! Get discounted new releases, sales, grab bags & more. Proceeds from our store benefit Celiac & Behcets disease foundations. Use my discount code insert your code here to get 15% off your purchase of $25 or more. If you’re looking for a Hero Arts product you don’t see in store, use the Request Custom Order button from with-in the shop. Pink from the Clearly Kelly Miami Collection. Categories: Baby, Clean and Simple, Digital, Handmade Cards, Hero Arts, Sugartree Stamps | Tags: digital kit | Permalink. Arlene here and I have a little (not so little) plastic folder with images in different sizes so that I can use them in the future and they sometimes prompt my creative brain (not the one usually in use) to go with the flow. This is exactly what happened here. I cut out the cup and chose the color of cardstock, cut it and went on from there. I thought I’d sweeten the cup with sugar and saw red yet again. I searched my ribbon box and came up with that great red and green plaid and added the other ribbon to liven up the design. I wasn’t sure about lining up the top tag, but went with it on a slight diagonal. It is pretty awesome in real life. Hoping this inspires you to get your fold on! I am at A Bit of This and That if you’d like to visit. The a2z scrapbooking store carries a wide variety of Hero Arts products as well as a nice selection of digital stamps! Get discounted new releases, sales, grab bags & more. Proceeds from our store benefit Celiac & Behcets disease foundations. Use my discount code Arlene15 to get 15% off your purchase of $25 or more. If you’re looking for a Hero Arts product you don’t see in store, use the Request Custom Order button from with-in the shop. Categories: Christmas, Coloring, Digital, Handmade Cards, Hero Arts | Tags: 2019, a2z Scrapbooking, a2z Scrapbooking Store, Arlene, card, Cards, Christmas, Christmas Card, Copic Coloring, die cuts, die cutting, digi, Hero Arts, stamps | Permalink. Our Guest Designer for April is Kymona Tracey. Kymona is a former a2z DT, she is talented and very crafty. She also has her own Etsy store that sell crafting accessories, you could check it out here. You can learn more about her at her blog: Kreative Kymona. Kymona created a set CAS journaling cards, these are perfect to go into any travel album, or art journal and of course onto cards too! Let’s take a look. They may look simple but they really do draw your attentions, don’t they? Thanks so much for taking time and design for us Kymona! For more info on her project, please visit her blog: Kreative Kymona. Thanks for visiting a2z today. Do you know that April’s Challenge is Fun Folds? Scroll down and get the detail and play along. The a2z scrapbooking store carries a wide variety of Hero Arts products as well as a nice selection of digital stamps! Get discounted new releases, sales, grab bags & more. Proceeds from our store benefit Celiac & Behcets disease foundations. Use my discount code a2z15 to get 15% off your purchase of $25 or more. If you’re looking for a Hero Arts product you don’t see in store, use the Request Custom Order button from with-in the shop. Categories: Clean and Simple, Digital, Handmade Cards, Hero Arts | Tags: a2z Scrapbooking, clean and simple, digital kit, journal | Permalink. I don’t usually make fold cards, but I might start making more of them since I finally got the hang of how to line up the die with my paper and how to FOLD it. I’m glad A2Z made me try. I have to tell you it came out so much better than I imaged it. How did that happen? On with the show. I think it was the monotone blue on this deep black background that made this so special. I will be leaving this on my desk for awhile to remind me to try new things and be an inspiration. You can see Arlene at A Bit of This and That. Categories: Christmas, Coloring, Digital, Handmade Cards | Tags: 2019, a2z Scrapbooking, a2z Scrapbooking Store, Arlene, card, Cards, Christmas Card, Copic Coloring, Digital, digital kit, Hero Arts, stamping | Permalink. Greetings friends and fellow crafters, LeeAnn here with my first project for the A2Z design team. 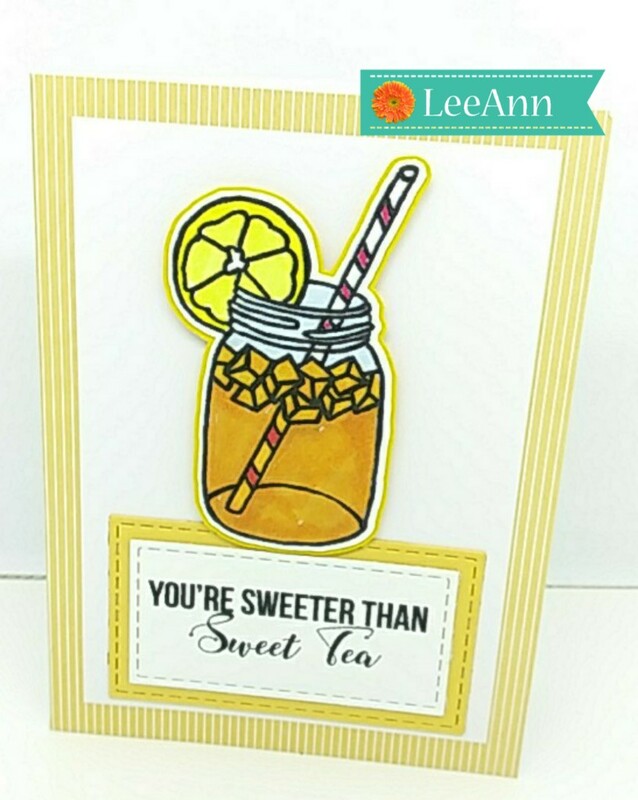 After deciding which images I wanted to use (the mason jar of tea and the matching sentiment) I sized them on my computer and printed them with my HP printer. I then used my Brother Scan n Cut to cut the mason jar of tea image, as well as a shadow for it. I used my Artist Loft markers to color the image and layered my pieces using ScraPerfect’s Best Glue Ever. My base is from a Hero Arts Birthday Card kit and thought the color was perfect to go with my image. Categories: Challenges, Coloring, Digital, Handmade Cards, Sugartree Stamps | Permalink. Sometimes you color some things, cut them out and they sit waiting for you to get some inspiration to continue. I thought receiving new dies would bring me inspiration and THEY DID. Very simply, I created a background of dies and staggered the cups up the smallest one and die cut a sentiment. I’m a tea drinker and my breakfast tea is always in a cup or mug, so my sentiment has to be one for tea. Remember to use my discount code at checkout – ARLENE15. Categories: Digital, Handmade Cards, Sugartree Stamps | Tags: 2019, a2z Scrapbooking, a2z Scrapbooking Store, Arlene, card, Cards, Copic Coloring, Digital, digital kit | Permalink.